After a long period of relative calm in the markets, it's a good time to reassess risk. Do you remember what risk feels like? While the market has hit a pothole or two during the current bull run, the ride has generally been smooth. Many--myself included--probably have a hard time remembering just how nerve-wracking the last bear market was. Ben Johnson, CFA, is global director of manager research for passive strategies, responsible for leading Morningstar’s coverage of ETFs and index funds. Prior to assuming his current role in 2012, Johnson served as director of ETF research for Europe and Asia. Previously, he was a senior equity analyst, covering the agriculture and chemicals industries. Before he joined Morningstar in 2006, he worked as a financial advisor for Morgan Stanley. Johnson holds a bachelor’s degree in economics from the University of Wisconsin. He also holds the Chartered Financial Analyst® designation. 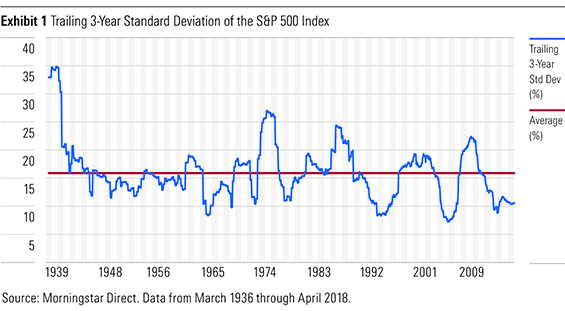 Below, I've included a plot of the trailing three-year standard deviation of the S&P 500 from March 1939 through the end of April 2018. At present, this measure of stock market volatility has been trending below its long-term average for 68 months. This marks the third-longest stretch of below-average volatility for the index dating back to 1939. The next-longest period lasted 75 months, from March 1956 through May 1962. So the current streak is unprecedented in the experience of most investors. Are you ready for when volatility rears its ugly head again? Here, I'll help you get reacquainted with risk: defining it and discussing how it's measured, how investors experience it, and how they can try to manage it. The most common definitions of investment risk are rooted in uncertainty. How likely is it that the returns on an investment will deviate from their expected returns, and by how much? There are a variety of ways to measure this likelihood, the most common of which I mentioned earlier: the standard deviation of returns. This figure helps investors understand how widely returns may fluctuate around their average. It is a metric that is simple, widely accepted … and deeply unsatisfying. Standard deviation falls short in a number of ways. It treats downside risk (the bad kind) and upside risk (the good kind) as equals. Also, it ignores the "tails" in the distribution of returns: those episodes that result in the greatest euphoria or most acute gut-rot. Of course, there are other risk measures that address these shortcomings. Measures that differentiate between good and bad volatility include the Sortino ratio and Morningstar Risk. The Sortino ratio is a variant of the Sharpe ratio, the most commonplace measure of risk-adjusted returns. Both ratios include excess returns over the risk-free rate in the numerator. But while the Sharpe ratio features standard deviation in the denominator (which, again, treats good and bad risk as equals), the Sortino ratio divides only by downside deviation. This gives a more accurate picture of an investment's return per unit of "bad" risk. 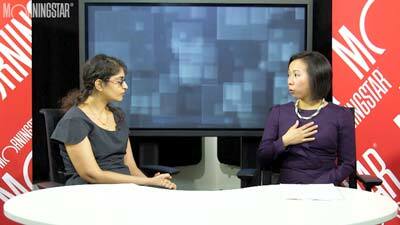 Morningstar Risk looks at risk exclusively. It doesn't ignore good risk entirely, but instead places greater emphasis on bad risk. This measure--which is calculated relative to funds' category peers--is baked into the Morningstar Risk-Adjusted Returns that are the basis of the Morningstar Rating for funds. While both these measures differentiate between good and bad risk, they still don't capture the worst of the worst. The most common way to size the sting in the left tail of the distribution of returns (the bad one) is maximum drawdown. Maximum drawdown captures the peak-to-trough decline of an investment over a given period. While not a worst-case scenario (that would be losing everything), it can provide a sense of just how much pain might be in store in a bear market. While all of these measures of risk have some degree of utility when it comes to framing investors' expectations, I think they're still inadequate. I don't believe that risk can be properly measured in a spreadsheet. In my opinion, the real risk lies in how we respond to the ups and downs in the market. The volatility that the above numbers attempt to explain is the net result of the actions of flesh-and-blood human beings. We are all responding to signals from our environment (that is, one another). These signals are being generated and interpreted by a hunk of gray matter that is wired for survival. We are risk-averse beings by nature. The real risk is that we do the wrong thing at the wrong time and put ourselves off the course toward reaching our goals. It's impossible to convey that with data. This concept of risk is absurd to measure because it is deeply personal. How investors experience and respond to risk will vary depending on personality, circumstances and experience. Investors' risk appetite may fluctuate with the market. It might also change with time. Investors' risk tolerance is driven in part by personality. Some people are wired to seek out risk, be it in the markets or by jumping out of an airplane. Others much prefer to play it safe, with their feet firmly on the ground. Then there are the sky divers who keep their cash under a mattress and the actuaries who like to bet on the ponies after work. The point is that risk is personal. Of course, investors' circumstances also affect their willingness and ability to take risk. Investors who have accumulated substantial financial assets likely have a greater ability to take risk, but they may wish to preserve their capital and thus be less willing to assume more of it. Investors' ability to take risk is also time-horizon dependent. Recent university graduates contributing to their employer's pension plan for the first time have ample ability to take chances, given that they likely have decades to save and invest before they retire. Investors nearing retirement may have less ability to take risk as they transition from accumulating financial assets to relying on them for retirement spending. None of these considerations is captured in standard risk measures. Investors' experience, be it investing in the market or in their careers, will also influence their relationship with risk. People who have lost vast sums in the market in the past may be uneasy about taking risk in the future. Serial entrepreneurs may be more comfortable with risk than company men. Attitudes toward risk will shift with the markets and evolve over time. Ask me now, years into a bull market, during a period of relative calm, to rate my willingness to take risk and I'll tell you that I'm happy to pour it on. Ask me nine years and two months ago and I probably would have said, "No thank you." Our attitudes toward risk are always changing. While in March 2009, I'd probably have passed on taking on more risk, the next time the market tanks I'll think back to what a tremendous buying opportunity it was and be more opportunistic (I hope). There are a number of ways to manage investment risk. I would put them into three buckets: asset allocation, investment selection and behaviour. Ideally, the first two should optimize for the third. Perhaps the most effective way of managing risk is to select an appropriate mix of assets. Investors with a higher threshold for pain should favour stocks. Those who are more squeamish should lean toward bonds and cash. Striking an appropriate balance is tricky. Just because certain investors don't like the ups and downs of the stock market doesn't mean that they can afford to skip the ride if they want to meet their goals. At this point in the market cycle it makes sense to revisit your asset allocation. Given their relative performance over recent years, odds are that many investors are heavy on stocks and light on bonds. If this is the case, it may be time to rebalance back to a more appropriate mix. The right combination will ultimately depend on many of the circumstances described above (risk tolerance, ability to take risk, personality, experience, and so on). Investment selection is another lever investors can pull to ratchet their risk. Large-cap stocks are generally going to be less risky than small caps. Developed-market stocks will be less volatile than emerging-markets stocks. Government bonds are safer than corporate credits. Investment selection extends into strategy selection when it comes to investing in funds. There are a host of exchange-traded funds, such as low-volatility equity strategies, that look to dial risk up or down relative to the market portfolio they draw from. These funds provide the opportunity to maintain market exposure while attempting to reduce their sensitivity to movements in the broader market. Finally, one of the most important sources of risk is the one we look at in the mirror each day. Poor decisions regarding asset allocation and/or investment selection can easily put us off course. As such, the choices made regarding the first two buckets should optimize for behaviour. The best portfolio is the one you're most likely to stick with the next time things get hairy in the markets. Trying to solve for this is the best way to manage the biggest risk of all.